The first time I saw Desperately Seeking Susan, I remember being unnerved by the image of three identical men, all dressed the same and leaning up against a building to ogle Madonna as she exited a cab. Little did I know that those three brothers were the center of a global media hubbub at the time. 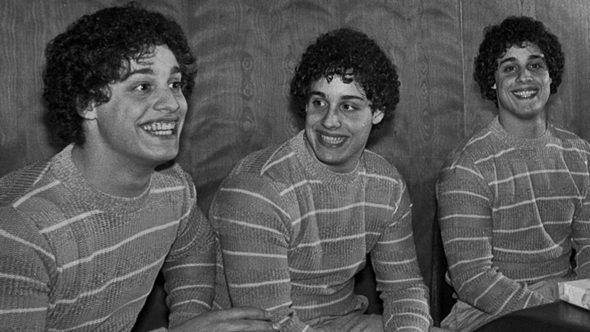 Back in 1980, as Robert Shafran moved into college, he was greeted warmly by many as “Eddy.” The 19-year-old would soon meet his doppleganger. Eddy Gallan—also adopted, also born July 12, 1961—and Bobby became inseparable friends. Brothers, actually, and their story attracted the attention of several newspapers as well as another young man born July 12, 1961. When David Kellman joined the crew, three brothers separated at birth held the world’s attention. This story itself, told warmly and with great compassion by documentarian Tim Wardle, is endlessly charming based on the contagious joy the brothers felt to be reunited. And you coast along on that charm for a while until this nagging idea creeps into the party atmosphere: why were they separated in the first place? Even those who remember the brothers’ tale will find this recounting fresh and fun. Footage and photos of their time together as young men paired with their own lively recounting of the story creates an energy that entertains. Wardle expertly moves the story forward, offering new, often funny and sometimes touching reminiscences of certain events from those closest to the action. Wardle’s less a master of visual storytelling. Stylistically, the film struggles. Some painful musical choices, stagy reenactments and otherwise uninspired visual representations give the film an amateurish appearance. Late-film montages of earlier revelations and quotes feel like information force-feeding. But, thanks to the truly fascinating story and the charm of its leads, these missteps don’t derail the effort. The filmmaker’s strictly sequential chronology relies on your assumptions about documentary and ensures consistent surprises. What begins as a zanier-than-life story slowly turns into a dark tale of conspiracy colored by larger themes of nature versus nurture. As Wardle pieces together a frustrating puzzle, he’s left with more questions than answers. Constantly revealing a new piece of information, a new source and more complications, the investigation itself becomes as much a character in the film as the triplets. If nothing else, it is quite a story.